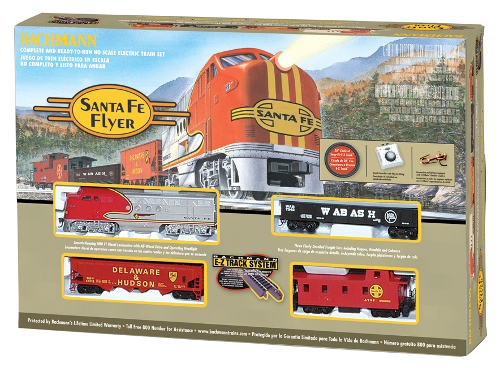 Hauling freight across the deserts, mountains, and cities of the American landscape is the SANTA FE FLYER. Powered by a mighty Santa Fe FT diesel locomotive with its distinctive “war bonnet” paint scheme, this sleek and powerful train deftly handles the ever-changing terrain of the Southwest United States. Shipping at actual shipping cost. Flat rate shipping does not apply. 22” radius curved track is best used to make relatively wide railroad curves. This track accommodates longer locomotives and rolling stock, and permits mainline operation at higher speeds. It can be placed on the outside of 18” radius curved E-Z Track® for double-track mainline realism. Four pieces of track make up one quarter (90 degrees) of a 44” diameter circle. Also available in bulk. The terminal rerailer is connected via terminal wires to a power pack, which provides current to power the layout. In addition to making power connections, the terminal rerailer is designed to correct derailments that sometimes occur during normal railroad operations. It can also be used to help properly align wheels on the track when assembling a train for operation. If you want to use the rerailer to help place cars on the track, you should install it so that it is easily accessible. Otherwise, it should be installed after a difficult section of track (turnout, crossing, “S” curve, etc.) where derailments may occur. Also available in the E-Z Track® system is a 9” Straight Rerailer (Steel Alloy) if you need a rerailer but do not need to make power connections.